Scientists and members of the public criticize proposed changes to New Mexico’s science teaching standards at an October 2017 hearing. Fossil fuel interest groups will continue debating the reality of human-caused climate change until the seas swallow us all, but among scientists the matter is settled. Last week, the National Science Teachers Association (NSTA) put out a position statement affirming as much and telling the naysayers to piss off. Published September 13, the new position statement opens by unequivocally acknowledging the “overwhelming scientific consensus” that Earth’s climate is changing due to human activity, while at the same time noting that widespread confusion exists among the American public. It recommends that science teachers and policy makers work to ensure basic science climate concepts are included in K-12 educational curricula—without the ginned up “controversy” pushed by climate denial groups. The NSTA—which calls itself “the largest organization of science teachers worldwide” with nearly 60,000 members—has issued position statements on topics ranging from laboratory safety to the metric system. Occasionally, the private professional association also weighs in on a scientific topic that’s become polarizing because of political ideologies or religion, like evolution. David Evans, executive director of the NSTA, told Earther that the decision to develop a position statement on climate change came about a year ago, as high-profile battles over teaching the subject played out in state legislatures and school boards and garnered national media attention. Last fall, controversy erupted in New Mexico over an attempt to replace climate change with “temperature fluctuation” in new science teaching standards. In the winter, a similar brouhaha occurred in Idaho, after state legislatures voted to remove most mentions of climate change from proposed K-12 science standards. Teachers have also faced pressure from outside interest groups, most notably fossil fuel propaganda machine The Heartland Institute, which recently mailed a misinformation-ridden report titled “Why Scientists Disagree About Global Warming” to hundreds of thousands of teachers nationwide. 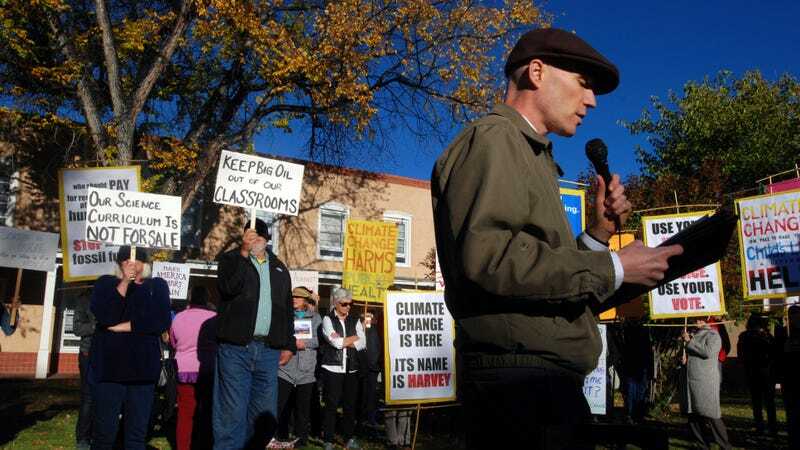 Both the New Mexico and Idaho efforts to water down climate science were eventually defeated, but many teachers, especially in more conservative locales, are still reticent to bring the politically-charged subject into the classroom. Evans hopes the new statement gives those teachers a firmer foundation to stand on and helps them acquire additional resources. The position statement recommends school administrators provide science teachers with “professional learning opportunities” that address climate science. Evans also hopes the statement gives science teachers some guidance on what they should leave out. In his view, the basic science should be taught in chemistry, physics or Earth science, while discussion of specific policy actions or mitigation measures belongs in a social studies class. Among American adults, there aren’t nearly as many of those informed citizens as one would hope. A Gallup poll released earlier this year found that only 35 percent of self-identified Republicans and 62 percent of independents believe global warming is caused by human activities. Those statistics can be turned around over time, but teaching climate science accurately is critical. A survey released by the nonprofit National Center for Science Education (NCSE) in 2016 found that while roughly 75 percent of public school science teachers devote some classroom time to the subjec, over a quarter “give equal time” to perspectives that doubt the scientific consensus. The same survey found that most teachers are unaware of the overwhelming scientific consensus on climate change’s causes, and that only about two-thirds see human activity as the primary driver. In Reid’s view, the new position statement hits the mark by raising a lot of these issues and suggesting school districts provide teachers more support to strengthen their knowledge.